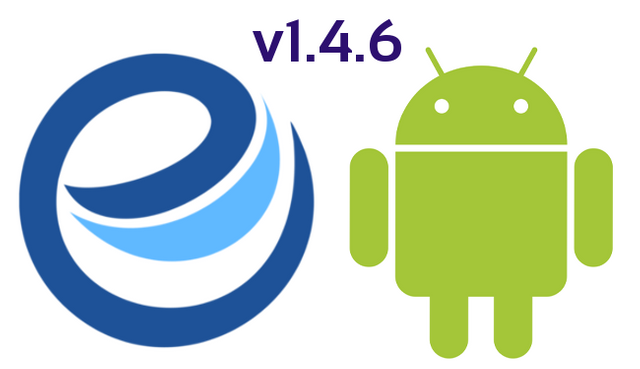 We are pleased to announce next release of eSteem mobile. This release has major new changes as well as number of bug fixes, performance improvements. If you have reported any issue, please review them and let us know if you still have them. For full details of the changelog and new changes, please read below. For those who find eSteem related post first time and don't know what eSteem is: It is mobile and desktop application for Steem! 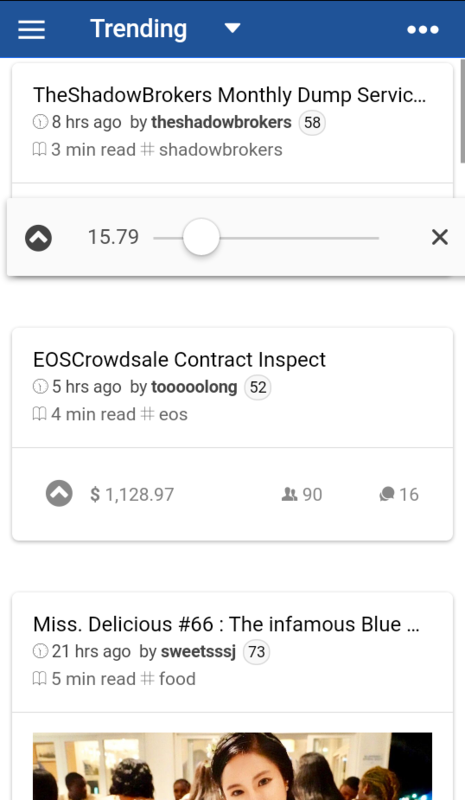 eSteem is offering some of the unique features (Bookmarking, Post Drafts, Image upload/capture, Personal Gallery, Notifications, many more) for mobile users! Evolution of eSteem desktop app is under development. eSteem supports multi-currency where you can see post rewards in any currency you like (BTC, USD, EUR, RUB, GBP, JPY, KRW, INR, CNY etc. ), multi-language (44+) where you can use app in any language you are familiar with, multi-account where you can add more than one account and easily change between accounts, multi-chain where you can use both Steem and Golos chains, multi-notifications where you can get notification for your multiple accounts for following activities Vote, Follow, Unfollow, Mention, Comment, Reblog, Scheduled post publish, etc! Check out this blog @good-karma for more related posts and latest announcements. eSteem invites - you can now invite your friends through eSteem invites, this is initial implementation which we plan to improve with future releases. Open any post and click on Share button on top right corner and share post through Email/SMS. Your friend will receive invitation and if you they app install it will open post you shared directly inside app, if they don't have app, it will redirect them to download app from relevant app store. 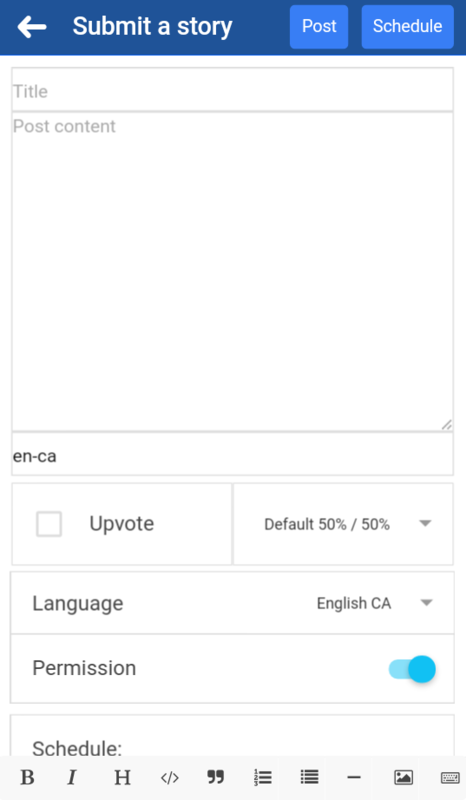 Post language - submit story Advanced option extended with language selection, user have option to select post language which will automatically add it as a suggested tag. Vote count - profile page improved, you can see your daily voting count next to your voting power. Voting decimals - voting slider has decimal points now ranging from 0.01 to 100. Username, Tags field filters to clear out mistyped characters like @, #, etc. Working to get this version available for iOS users as well. Appreciate reviews and feedbacks on Apple AppStore and Google Playstore as well as ProductHunt, please leave reviews, feedbacks on app stores because it help us to attract more users to the platform. If you have suggestions or found a bug, please report them here with comments or on Github and we will work on them as soon as we can. Thank you for this great app. It really help me since im not used to use mobile browser. For Android and iOS version updates are very fast, but I'm waiting for the final version for windows that is under development. I really liked the Vote count feature and Voting decimals. Maybe @steemit also provides the feature for the browser version. This post received a 1.8% upvote from @randowhale thanks to @hackerwhacker! For more information, click here! Congratulations! This post has been upvoted from the communal account, @minnowsupport, by GuyFawkes4-20 from the Minnow Support Project. It's a witness project run by aggroed, ausbitbank, teamsteem, theprophet0, and someguy123. The goal is to help Steemit grow by supporting Minnows and creating a social network. Please find us in the Peace, Abundance, and Liberty Network (PALnet) Discord Channel. It's a completely public and open space to all members of the Steemit community who voluntarily choose to be there. Hey @good-karma, thanks for the updates. Really great work. While I understand the reason behind changing the share button, I dont want to send links around through sms. 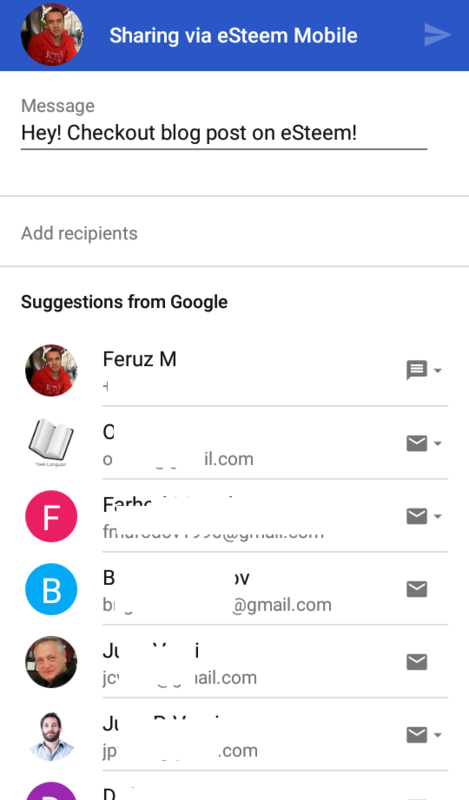 Can you please make a choice field so I can use line or whatsapp for sharing? You could implement a permalink within the regular steemit.com link that appears. Appreciate the feedback, there is a way to make links internal and keep other social media sharing. would app open and redirect user to that page, if they have installed app... Second time someone shared same concern as you did and I think we will have both choices with next release. This release was initial implementation of internal sharing which is even more convenient if you are using app, also first stepping stone to invites/referrals which we are doing research and exploring some options. I updated esteem right away after seeing your post. It looks better and more user friendly in many aspects! Thanks for the continuous improvement and timely updates. Using esteem has been a very satisfying experience, i have also recommended it to my friends! Oooow amazing.. A blast of features coming our way. As always thanks for being awesome. These features are going to greatly benefit the community and the growth of steemit. Yes, thanks you very much @good-karma, I am very happy to hear it, a good information and a steady performance results, esteem is now getting cool and more okay, now I have updated the latest, and the result is very satisfactory. This is amazing announce next release of eSteem mobile. With major new changes as well as number of bug fixes, performance improvements, wonderful update @good-karma I like it so much. We will follow your intruction in esteem. Everything because of you. Iam very glad to use esteem aplication to steemit. I hope you be good family in this platform. I will waiting for your next post, and I will upvote and resteem everytime my family @good-karma. I like your style and your post. With pleasure Iam waiting for you and helpme to get good profit in my blog. Good to know that an update is available! 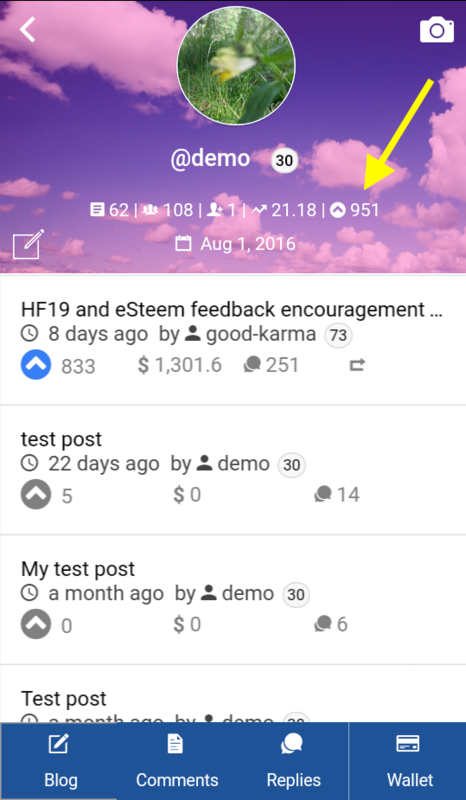 I have started using esteem mobile apps this week and found it quite easy to use, with neat layout that increase the accessibility to steemit using mobile phone. However, I have experienced several times that when I try to post my comment via esteem, the apps basically hangs and shows the loading sign forever! I have to force close the apps but the comment will be lost! It is frustrating and I sincerely hope that such a bug can be fixed. Thanks for listening. Blogging on steemit will get so much easier when users can upload content from their smart phones. Oh! I have wait for it for a long time already! Nice and great update! 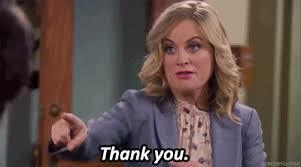 Thank you very much for your effort to making a very nice and helpful apps for us. As a newbie, I am very appreciate for your work! We all know that it need many time and effort to develop a app! Keep it , always support you! Great update on the app! Definitely a @good-karma. I have been using it for a day now and one thing that i noticed is sometimes the app is kind of slow and crashes. I am using an iPhone 5s. I don't know... maybe my phone is too old for this app.. I really like the post scheduling feature! Anyways, thanks for the update! Kudos! Cool! Thanks @good-karma. Keep it up! Thanks, added to ignore list! how actually was he getting those rewards? I am also using esteem, downloaded today but did not get any upvote, maybe i am new ? Thank you very much for this news!! im waiting for the iOS update. I found a bug on iOS version, i dont know why but sometimes it turn off all the notifications! Thank you for continuing making eSteem to the next level! I think the voting deciamls place is useful , especially to the whale, you know the voting power is limited and rare after the HF19 has been launched . Looking forward to the update in ios version too! Nice to know that there's an app for steam! gonna download this later. Thanks for the app! I'm liking the interface and can't really fault it to be honest. The only issues I'm having is performance. It can be slow to load things like comments and also quite often I have to restart the app because it lags out and clicking actions like reply do not work (it even did it with this comment). One last thing, my phone keeps alerting that the app is eating my battery (usage in last hour is 2.24% and I've only been on app for 15-20mins). Yeaaah, this why i love steemit so much. As one of users, i believe that steemit will become easier to use it. I have not tried esteem yet but it looks that it is a must so we can keep steeming even on mobile with ease. This comment has received a 0.46 % upvote from @booster thanks to: @cryptokraze. Can we see who voted on our post as in web? I cant wait for the desktop version to come out. I love the idea of multiple draft posts, so I can work on several drafts at once and then schedule them for posting when I choose. Keep up the good work! This app keeps getting better and better. It's already the app I use the most for Steemit. These new updates look pretty nice. Anyone knows where can I see how many people use Steemit via eSteem app? You can check steemdb app section, there are currently over 5k posts everyday made through eSteem. This looks like a nice app, but please could you explain security measures that one should use. I am a bit afraid to install this on my phone with all the viruses and keyloggers that could be installed. If you have keyloggers or malicious apps on your device then none of the apps you have is secure. But if you worry about security of the eSteem, your keys are safe and only stored on your device, they never leave your device. Project is opensource and you can audit source code if you want as well. There is PIN settings which can give you extra security if you worry about loosing your phone or someone else has access to your phone. Hope it helps to clarify some points/concerns. Innovation in action @good-karma , I am impressed and send in my full support. Steemit is great because of people like you and your team working hard to make steemit a better place for all. Thanks and wish you more success. Thanks for the information. Its help me very much. Please give such more information. EXCELLENT, Thanks for the heads up!!! For older devices, we did our best optimization we can and of course we will continue to improve some other parts. If you have slower internet that might also be one factor. You can use Compact View mode which won't download images on front page, you can also disable Fetching images from Settings page which won't download images within post to save bandwidth and improve performance a bit. Thank you for your post, I was trying to find an app through the Google Play, but I failed. Now, I know how to install. Best regards. Re-steemed. I am One of the BIG Fan of eSTEEM APP. LOVE the APP !!! By the Way is the UPDATE Available in GOOGLE PLAY Store or Takes time to GET the NEW UPDATE... Regards @steem-help ! Yo, this is awesome! After this, why would anyone continue to use facebook?! I just installed it now it great. thats cool i did not know we had this..
thanks for having an amazing vision for how a mobile experience for Steemit should take shape! now you can share it. Good post @good-karma! ⚡ I've been having trouble managing my account with mobile eSteem. Perhaps it is being improved as we speak. Thanks for sharing! So the language thing is being taken care of, now just the buket(s) of crabs & that is that. thanks for sharing the updates @good-karma, it's great to see so much progress! Very happy about the updates esspecially the "eSteem invites" I downloaded esteem about a week ago on my samsung s3 mini and I am very very happy with it. Thanks Guy's! 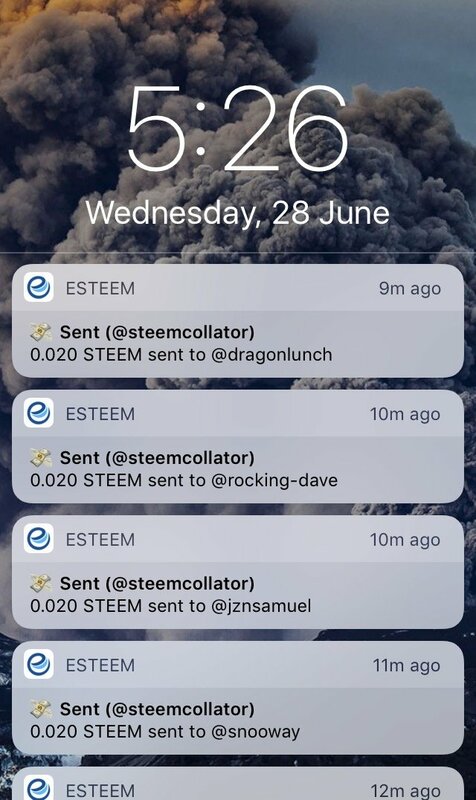 The only possible bug I have noticed is if I re-steem from the esteem app, once I log in on my pc my resteem logo's do not show up green as re-steemed, but if I click re-steem I get the notification the post has been. I hope this makes sense? Thanks once again keep up the good work! Might have to trade my iPhone in for an android! Looking forward to the iOS update! Thanks for keeping us posted! Today is my 2nd day using eSteem. There is some Bahasa Indonesia translation missing and some suggestion though. Oh my god! I love this update. Thank you for develop esteem! Good job. Thanks once again keep up the good work! Thank you very much @good-karma for your information. esteem apps will be very helpful for android users. Nice updated from You. Hello. I am Moksh Rajput. I am a crypto enthusiast and a stock market trader/investor. I do technical analysis for stocks and crypto's. Can you take a look at my posts help me out, by giving me a shout out or upvoting my posts! @good-karma. I have esteem. Never used it. Last time I engaged you with a query about the safety aspect and you cleared my doubt and installed lot of confidence. I shall try the improved esteem soon. Thanks. Thanks. I can't wait to try new iPhone version. Can I just say, I've been on this platform for almost 2 months now and all of these things that were annoying me or thought could be done but weren't done because, well, I presumed it was due to Steemit still being in it's beta phase, was right here already in this beautiful app they call eSteem. Yeah it's a mobile app but there is a desktop app coming! I'm just delighted that this exists! To all involved in this project, well feckin done! If any of you are in Scotland any time I'll buy you all a pint! Writing is very useful, very dear if missed. And this is very interesting writing, success always for you. glad to see the updates. I've just started using esteem app and love it. Do we just update the app to get the new features? A nice upgrade, just updated the earlier installed version. Keep up the good work. I am new member and i believe soon appstore version..
How do I log in esteem? Great job, do you fix the issue where your self-vote is not remembered after saving the article for later submission? Cool updates, I'm going to test!